Here, during the Second World War, more than 500 Canadian and American civilians were trained as intelligence specialists by the British Special Operations Executive. Serving on dangerous missions abroad, these secret agents were not legally protected if caught nor were they openly recognized for their courage and sacrifice. The first school of its kind in North America, Camp X was also an advanced top-secret communications relay station until it closed in 1969. 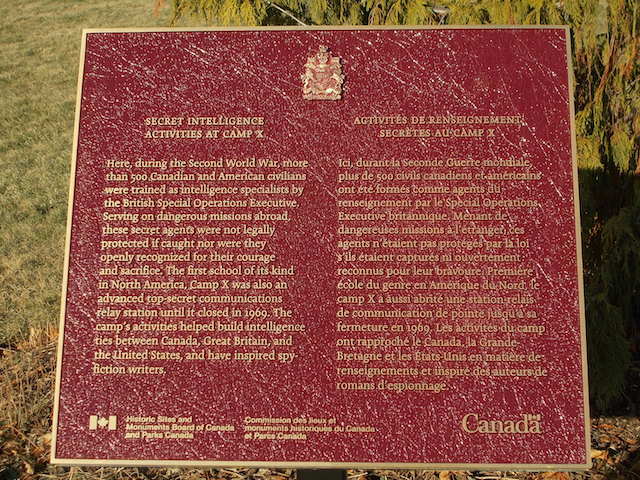 The camp's activities helped build intelligence ties between Canada, Great Britain, and the United States, and have inspired spy-fiction writers. The federal plaque was erected in November 2014, next to a monument which was built in 1984. Four flags surround the memorial: those of Canada, Bermuda, the United Kingdom and the United States. Bermuda is where Camp X's founder, William Stephenson, eventually lived, died, and was buried. That colony's flag could easily be mistaken for that of Ontario, one of several similar flags which augur well for a new and unique flag for Ontario. On this site British Security Co-ordination operated Special Training School No. 103 and Hydra. S.T.S. 103 trained Allied agents in the techniques of secret warfare for the Special Operations Executive (SOE) branch of the British Intelligence Service. Hydra Network communicated vital messages between Canada, the United States and Great Britain. This commemoration is dedicated to the service of the men and women who took part in these operations. In Memory of Sir William Stephenson"The Man Called Intrepid"
Born at Winnipeg, Manitoba, January 11, 1896. Died at Paget, Bermuda, January 31, 1989. Director of British Security Co-ordination. 1941-1946. In 1941, a spy training camp was established on this site by William Stephenson (1896-1989) "The Man Called Intrepid", the Director of British Security Coordination. Many secret agents were trained at the camp for spy missions in Europe during the Second World War. Among those was Ian Fleming, author of the James Bond spy novels. In 1945, the Soviet defector Igor Gouzenko was hidden here after he revealed a Russian spy ring in North America. Camp X was a Canadian Government communications centre from 1946 to 1969. A parcel of the land was sold to the Town of Whitby in 1971. A monument dedicated to the people of Camp X was erected on the site in 1984.